This weekend, I took my yen for vintage cards to Rosemont, IL and the 2013 National Sports Collectors Convention, meeting with two dozen friends from OBC and wandering a labyrinth of dealer tables that stretched from John Rumierz, source of dusty Venezuelan type cards, to shiny plastic slabs by the caseload at the Collector's Collection booth. Between those extremes, thousands of hobbyists wandered the concrete aisles with money to burn. Toss in carpeted corporate booths for Topps and Upper Deck in-between and you've got a party: a stubbled, t-shirted, cargo shorted, and New Balanced party. While so many potential stories to tell, let's open with my started-at-the-show set, 1954 Red Heart Baseball. 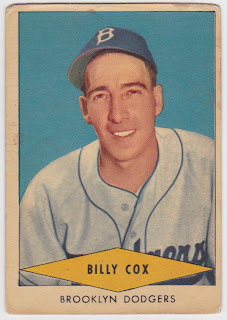 Its hand-colored portraits of 33 players nicely capture the mid-50s style and I ramped up with this handful of $5-10 purchases. 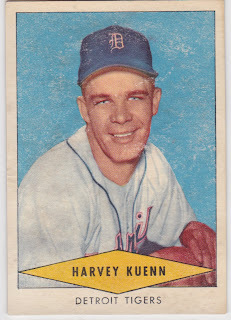 10-time All-Star Harvey Kuenn was known for a great batting eye and varied defensive abilities, sort of a 1950s Rod Carew. Like Carew, he's one of the handful of batters with 2000+ career hits to garner under 100 homers. After his 15-year playing career, Harv also helmed the 1982 Brewers (a.k.a., Harvey's Wallbangers) to their only World Series appearance (so far), earning AL Manager of the Year honors despite being in charge for just 2/3 of the season. Why would Red Heart Dog Food make baseball cards in the mid-50s? Most likely, they saw a chance worth taking. The sport exploded after WWII and Red Heart recognized how fierce competition between Topps and Bowman brought kids to the candy store--why not try another family product? 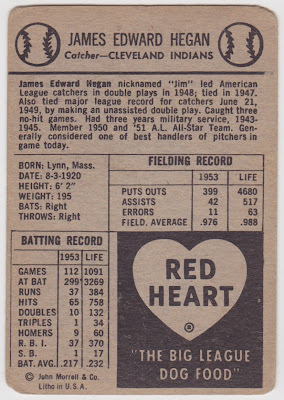 While printed in 1954, Red Heart continued to offer their sets via mail order into the 60s and 70s, so singles aren't hard to find today. 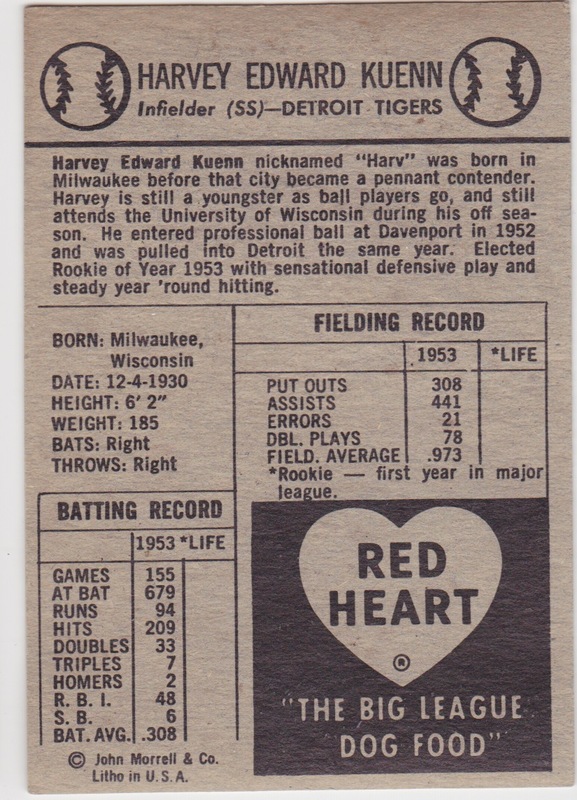 COOL: Kuenn debuted as a pro in Davenport, Iowa, the first place I ever saw a game (at age 3). 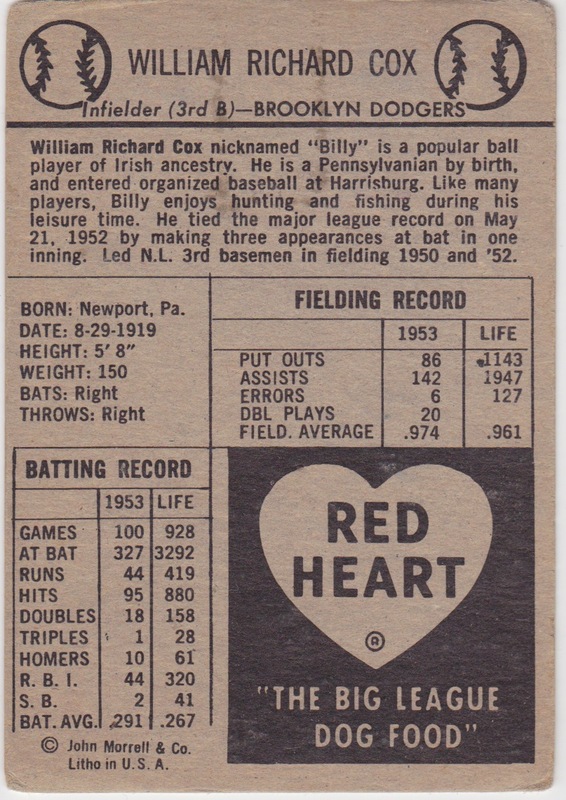 Many of the bios mention a player's heritage ("popular ball player of Irish ancestry"), something with real cultural significance following WWII, when the American government and media spoke to a shared, somewhat homogenized national identity. In part, this recognized the significant wartime contributions from immigrant families, but also acclimated young fans to a newly-integrated sport. Many 40s and 50s movies and books echoed this melting pot sentiment on a broad scale, reflecting the grassroots march toward expanded civil rights in ensuing decades. Red Heart printed three 11-card series of players with blue, green, and red backgrounds, the last being somewhat scarcer. 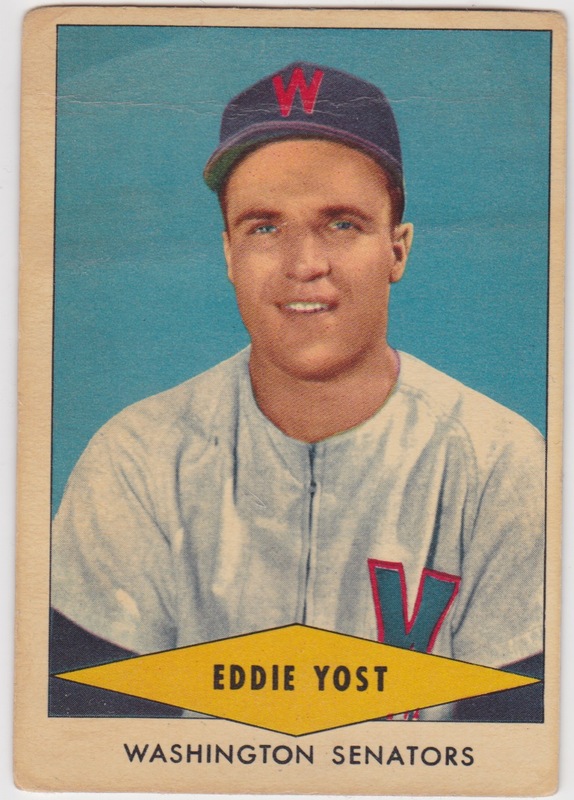 I didn't pick up any green in my starting salvo, but saw a sharp (if miscut) Duke Snider for $35. Hope I don't grow to regret not pulling that trigger. 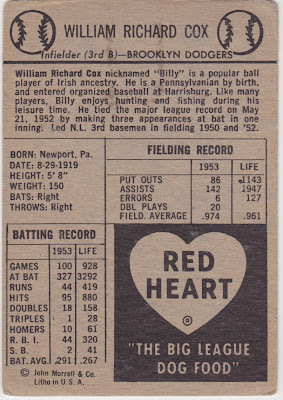 Note how much text Red Heart dedicated to fielding stats on their cards. These days, you're lucky to get a brief text comment about a player's glove work while batting or pitching dominate the stat grid. 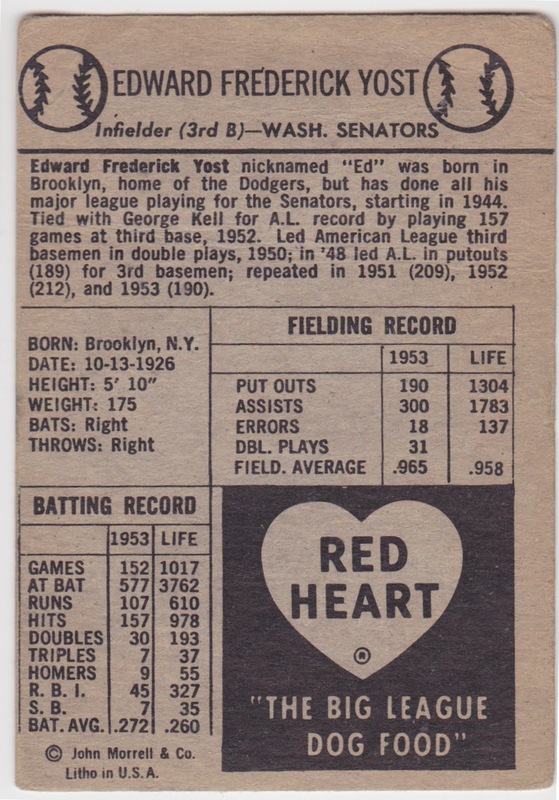 COOL: Nicknamed "The Walking Man," Eddie collected nearly as many free passes (1614) as hits (1863) in an 18-year career. 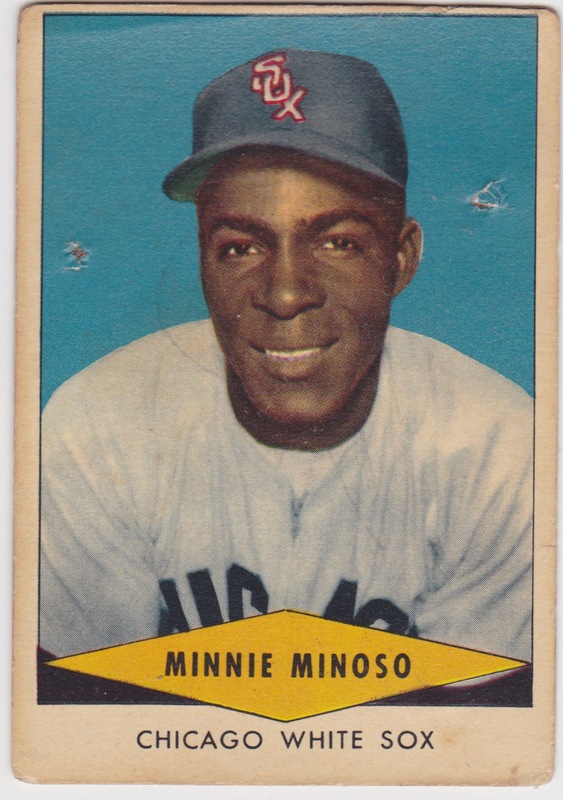 Miñoso's already on one of my favorite #5s, his 1952 Bowman rookie card. This Red Heart portrait might've been a young Chicago fan's bulletin board highlight, given those tack holes but otherwise nice treatment. Minnie holds a special place in history as the oldest batter to hit safely (a single in 1976 at age 50) and oldest to bat in 1980, giving him appearances in the 1940s, 50s, 60s, 70s, and 80s. 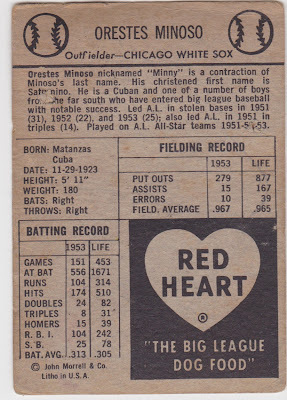 His 1976 games represent another rarity as DH at-bats from 9th in the batting order. 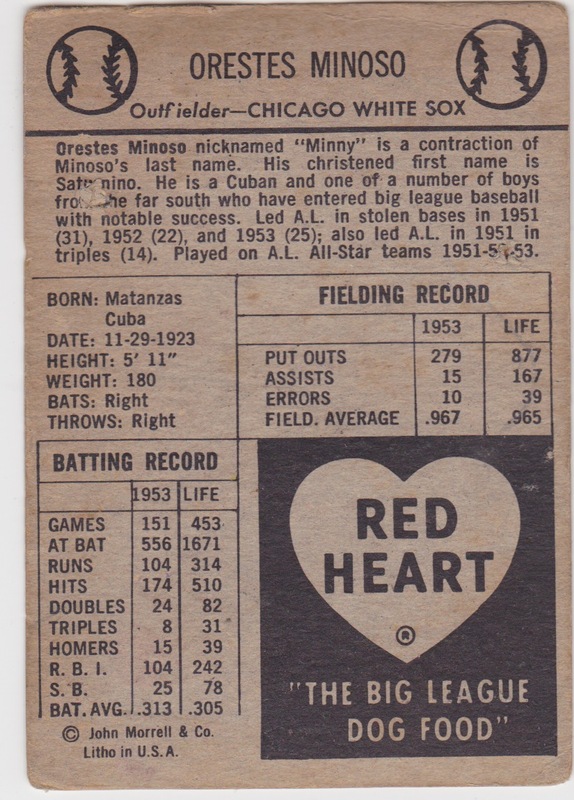 COOL: Miñoso batted in those 1980 MLB games a full three years after his son (Orestes Miñoso, Jr.) retired from pro ball. Here's my first player from the set's scarce "red" series, which also includes Hall of Famers Stan Musial, Ralph Kiner, Richie Ashburn, Bob Lemon, and Red Schoendienst. Cleveland catcher Jim Hegan's nowhere near the hitter of those five (even his battery mate Bob Lemon had a higher career OPS+), but he played in 17 seasons and 5 All-Star games on the strength of defensive skills & game management. 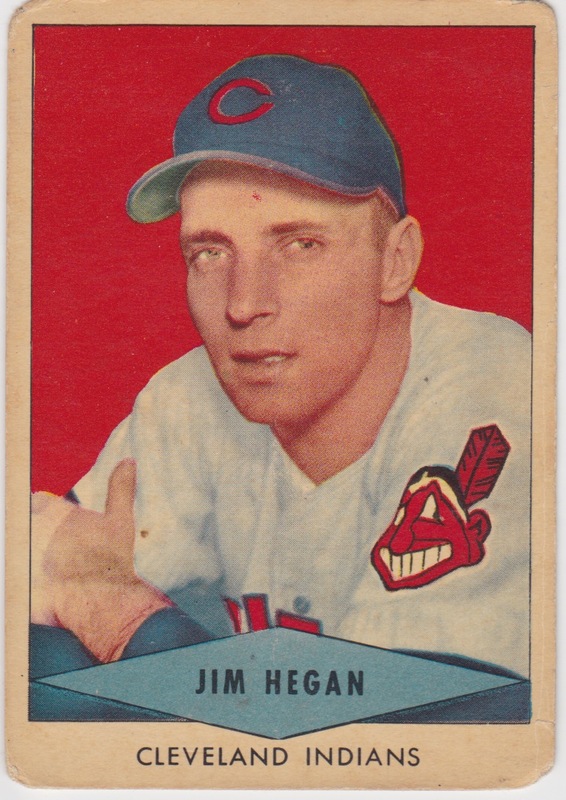 As Bill Dickey said, "When you catch like Hegan, you don't have to hit." "Leading catchers in double plays" usually meant throwing out runners after a strike out and Hegan averaged 50% caught stealing. 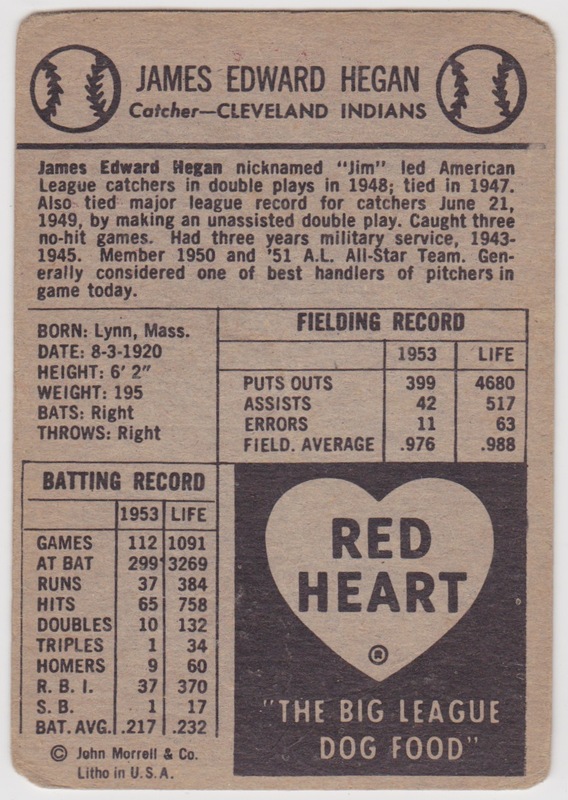 The particulars of his unassisted double play aren't clear (other than "4th inning on June 21, 1949"), but given Philly's bases loaded situation, Hegan probably fielded a nubber, then forced a runner at home and tagged the batter in quick succession (box score). COOL: Hegan's top-20 all-time for games caught and never appeared at another position. That's my newest set (and effective wantlist) thanks to the 2013 National. See my next post for scans of other hits from the show, 1933-1962! Awesome cards. Best batch I've seen in a while. Love the Harvey and Minnie. Thanks, there are some great ones in this set!